Less than a week away most of us will be eating Thanksgiving dinner with their families and loved ones. I am not sure about you but Thanksgiving is the one day of the year when I do not care about butter, fat, calories or carbs. I usually eat way too much and feel gross for a few days after. I have signed up for a few virtual 5K's and 10K's over the next week to keep me on track for my half marathon (3 weekends away!). This also means I can eat more fried turkey! A few November Virtual Runs anyone can participate in. All benefits go towards Hurricane Sandy Victims. Amazing prizes from all of your favorite brands. $20 minimum donation will go towards prize entry. This is a great way to give back to all of those in need. 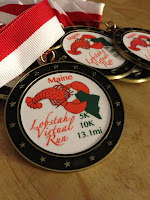 100% of proceeds go towards a knee surgery for Tony & you get a lobster medal, click here for Tony's story. 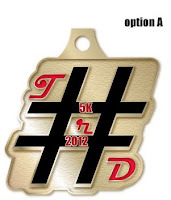 All participants receive a tech shirt, half marathons automatically receive a medal and 5K has an option for medal or no medal. This is great! I am already registered to run NYC Running Mama, Race for Recovery 5K-10K! I may have to register for the Team Run Disney Virtual 5K since I will be missing the WDW Half marathon.